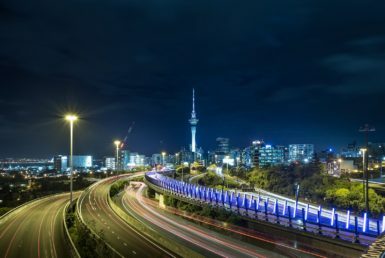 What’s on the horizon for the Auckland property market??? If you’ve been following the media or reviewing your mortgages over the past few months you will have noticed that banks have become concerned about their lending exposure and have already begun to raise interest rates gradually. It’s also no secret that the reserve bank has aimed to reduce property prices as well, but has been hamstrung by their priority to keep the NZ dollar low to benefit our export economy due to the struggling global economy. This has resulted in a record low for the OCR of 1.75%, however this is tipped to begin a gradual increase along with bank mortgage rates over the next 3 years starting later this year. The effect of this will put pressure on buyer’s affordability in regard to servicing mortgages and in effect limit them further to what they are able to spend on a home. Some banks are now beginning to stress test mortgage applications at 7%. Taking this into account it could be reasonable to assume that it will become more and more difficult to achieve similar prices as we are experiencing now as we approach 2019. Certainly the market has been a bit patchy since late last year in terms of actual sales numbers and prices achieved. Jan & Feb have been much the same but open home numbers were a little bit better with many new buyers entering the market. By no means have we bounced back to the level of enquiry we had early last year. The new buyers seem to fall largely into the “market spectator” category with potential to become serious and competitive over the next 2-3 months. They’re aware that as time goes on it’s going to get more difficult to get finance approved as the banks clamp down and interest rates begin to rise. After a few months of browsing open homes they’re becoming more and more motivated to make it happen and get on the property ladder. For these reasons we expect to see some heightened market activity through April, May & June but as we approach the election and all its distractions later this year things may slow down a little again. If you’ve thought about selling lately now might be the perfect time to look at the options, get in touch for a confidential and no obligation chat about how we can help, we’d be more than happy to give you a free appraisal so you’ve got a more accurate idea of what your property is worth in today’s market. 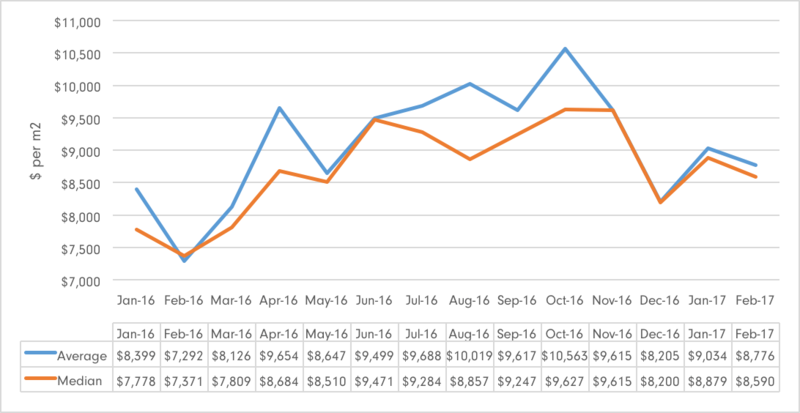 See the graph on the next page for a trend comparison of median and average square meter rates for apartments, townhouses and units in the central western fringe through 2016 and into this year. 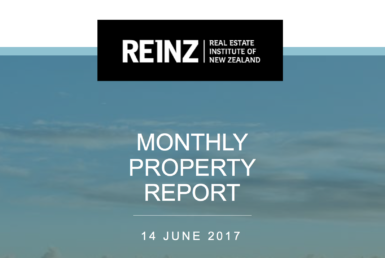 *** REINZ data range: Apartments, Townhouses & Units in the suburbs of Eden Terrace, Freemans Bay, Grafton, Grey Lynn, Herne Bay, Kingsland, Ponsonby, St Marys Bay and Westmere. 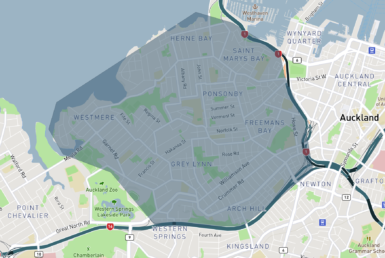 M2 information was taken from REINZ & Property Guru data and includes car parks and balconies. As we can see in the graph above September and October were definitely the peak months for the year. Consistent with general industry feedback there was a notable decline in December which is usually affected by the festive season but we haven’t seen the market bounce back in February that would’ve usually been expected. The latest LVR restrictions coupled with the lack of growth in average incomes has definitely had an effect on the market with investor competition reducing. First home buyers have also been a big part of driving the apartment market upwards, and have now reached a point where they’re really struggling to muster up the substantial deposit amounts required for finance at the price levels. 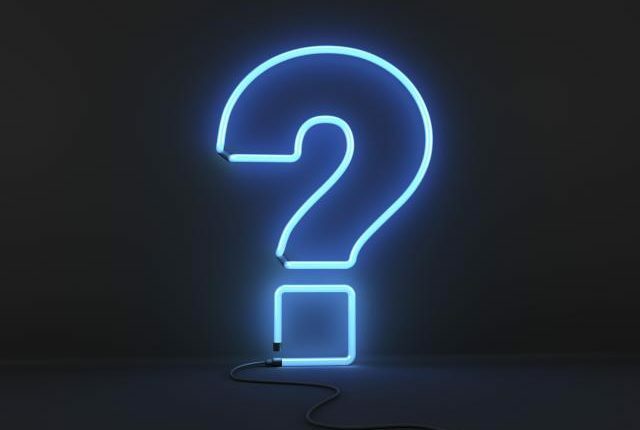 If you’ve had thoughts of selling and would like some advice on preparing for sale and what the best method might be for your property, or just want an opinion on its value from professionals specialising in the area we’d be more than happy to help.